This set of MATLAB Multiple Choice Questions & Answers (MCQs) focuses on “Default Variables”. Explanation: The scope of the syms command ends when the input is a comma or a semi-colon. q is already declared to 0. q is not taken input as a symbolic variable. There would’ve been an error while trying to define q after a comma but it does not occur since it was already declared as an integer variable. 2. What is the default variable while evaluating a transfer function? Explanation: The MATLAB evaluates the transfer function according to the basic definition of a transfer function. So it represents a system in the frequency domain where the frequency is defined by ‘s’. 3. What is the default variable while evaluating a Laplace transform? Explanation: If no variable is specified within the laplace command, the function gives the laplace transform of the input function with ‘s’ as the independent variable. Hence, s is correct. Explanation: The input to the laplace command has to be a function which has been already declared. Hence MATLAB returns an error for this code since the t is not defined previously. It wouldn’t give an error on p.
Explanation: The default variable in MATLAB is x. Since w is nearer to x than z, the command will return a solution for w since we haven’t specified the variable who’s solution we seek. Hence, the answer is –z. Explanation: Unless specified, the solve command would take x as the default variable who’s solution is being sought. If the function did not have x as an independent parameter, the default variable would’ve been variables near to x. 7. What is the default parameter for dsolve() command? Explanation: The dsolve command returns a solution which is parameterized by the variable that has been used as a differential in the input function. As such, there is no default variable for this command. 8. What is the default parameter for the ztrans() command? Explanation: The default parameter for the given command is z. This is a pre-defined command in MATLAB and uses the basic definition of the Z-transform to evaluate the result. Explanation: y hasn’t been defined as symbolic. The output of the laplace transform won’t be derived since their will be an error. If we specify a desired variable, we have to declare it as symbolic before giving it as an input to our laplace command. 10. The default variable, to which the result of any computation. 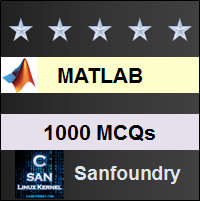 Explanation: Any result is assigned to the variable ans in MATLAB. If we specify a different variable, it will be assigned to that variable.